The other day while making dinner, I realized that my favorite kitchen knife is not necessarily the one that is the sharpest. 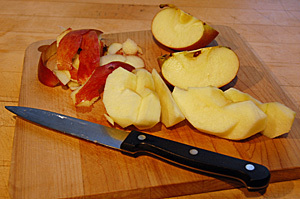 It is instead the one sharp enough to peel an apple, but not so sharp that I will injure myself. It’s also great for scoring the interior fruit of an avocado, and fits in my hand just right. This got me to thinking that there are times when being less sharp, less focused, can actually be of value. And I realized that I’ve noticed this before in other ways. For instance, when I’m stuck on something – trying to remember a name, for example – then I’m better off taking away the focus, thinking of something else, and then it will come to me later. And with my new business, I sometimes get frustrated if things aren’t moving quickly enough and I’m not crossing items off my to-do list. Networking and making connections can take time. So instead I exercise at the gym or work the crossword puzzle, changing my focus. Sometimes while I’m doing that, I think of a new idea or a new way to approach my business needs. I’ve even had an idea for a blog while brushing my teeth. “What explains the creative benefits of relaxation? The answer involves the surprising advantage of not paying attention. Although we live in an age that worships focus—we are always forcing ourselves to concentrate, chugging caffeine—this approach can inhibit the imagination. We might be focused, but we’re probably focused on the wrong answer. “And this is why relaxation helps: It isn’t until we’re soothed in the shower or distracted by the stand-up comic that we’re able to turn the spotlight of attention inward, eavesdropping on all those random associations unfolding in the far reaches of the brain’s right hemisphere. When we need an insight, those associations are often the source of the answer. So the next time you’re stuck on something, get away and relax, maybe cut up an apple to munch on, listen to some music, and soften your focus. You might be surprised by the results. P.S. Click here to read the full WSJ article on How to be Creative.